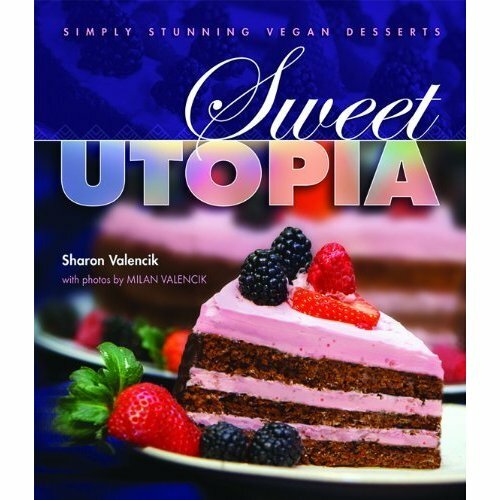 Sweet Utopia is the latest dessert cookbook to grace the vegan world. The title sufficiently fits the book. Not only are the recipes simple with easy to find ingredients. A picture is offered with each dessert. The author and photographer, a married couple, compliment one another perfectly. The pages are graced with mouth-watering desserts from simple yet tasty cookie recipes to decadent cakes and pies. The book also offers mousse, pudding, bars, granola and even ice cream. The options in Sweet Utopia seem endless. The recipes tested were perfect. The Ultimate Peanut Butter Cup Cake was moist with a not to powering peanut butter presence and a chocolate peanut butter icing that will melt in your mouth. This cake will definitely become a quick favorite. The Chocolate Chip and Nut Streusal Coffee Cake was far from your average coffee cake. The streusal melted on top of the cake and dipped into the center of the cake when baked. Leaving a gooey streusal center delicious in each bite. The cookies tested were the Green Speckled Oaties. Oatmeal cookies with spinach seem a bit far fetched for even the most dedicated cookie lover. The spinach was very mild and favored by even the pickiest of children. The Lemon Hearts were a simple cookie with a citrus punch. Refreshing and mild. The Almond Macaroons were a creation made in heaven sans the egg whites. The coconut lightly toasted during the baking process made these macaroons one of the better recipes out there. The Orange Burst Cookies ‘n’ Cream Cookies were the kind of sandwich cookies one might remember from their childhood, but on a much higher level. The orange gave the cookies a tanginess that was refreshing. A sandwich cookie made for the dog days of Summer. The cheesecakes reviewed exceded expectations. A good vegan cheesecake is hard to find. Search no more. The Coconut -Almond Cheesecake Pie was a flavor combination. The cheesecake was smooth and creamy. And the dynamic duo of coconut and almond can’t be beat. The Pumpkin Cheesecake Pie is a must have for the holiday season. It baked smooth and left no crack in the top of the pie like most pumpkin cheesecakes and pies. Sweet Utopia is one of the tastier dessert cookbooks published. As the cover states, “Simply Stunning Vegan Desserts.” This is a factual statement. A must have for any lover of dessert and vegan who has been searching for those long forgotten desserts that were once enjoyed only by the omnivores.